See why I'm hooked. This is a cookbook that's not just about great food by sharing a piece of the heart. Food at its best isn't just about taste and texture, but about the love, care, and memories that each bite conveys. Donald Link's Down South is about sharing those Southern memories and hospitality. I can't imagine a better guide than this James Beard Award-winning chef who's traveled and sampled food throughout the South. 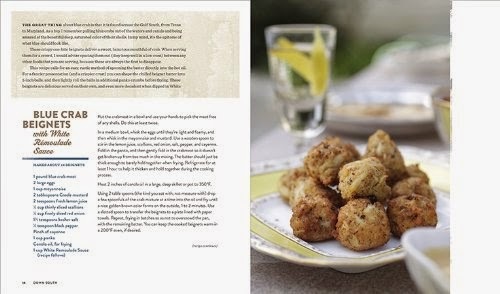 Some of the cocktail party recipes I know will become my own, in addition to the Blue Crab Beignets, are the Fancy Spiced Pecans, Sweet and Sour Onion Jam, Spicy Cheddar Crackers, and Parmesan Bacon Gougeres. Now I just need the occasion! My trip through the South with Link continued to the most Southern of delicacies - the barbecue. Yes, I began to scent the aroma of hot coals and slow grilling meats. Being a Northerner with a Southern heart, I loved Link's description of what sets barbecue apart in each region. Now who's ready to take a road trip with me to sample all the various forms of barbecue? Well, if you can't get a way now, you can recreate many the sense of the Southern barbecue thanks to Link's recipes. The seafood section is the one I'll be returning to again and again. Yes, this girl would love to transplant herself to a Gulf Coast town, but if that's not in the cards, I'll be making Watermelon Gazpacho with Crab Meat, Beach House Ceviche, Shrimp and Crab Spaghetti, Scallops with Green Garlic Butter (oh, this brings back memories of shucking oysters for a similar dish in a French Alpine hotel). The variety of shell fish recipes is outstanding. In addition, Link explains the different types of shrimp - the Gulf shrimp he grew up with, Royal Red shrimp form the Florida-Alabama border. I've never been brave enough to try making Soft-Shell Crabs at home, but may well do so once they're back in season with Link's recipe and careful instructions. What meal is complete without fabulous side dishes. I'm already plotting out carrot-raisin salads, Cajun macaroni salad, among several others. Finally, the desserts in Down South rock! I'm ingesting calories just reading the recipes, but each one will be worth it. Salted Caramel Peanut Brittle Ice Cream, White Chocolate Macadamia Blondies, Hath Bar Brownies with Fudgy Chocolate Icing, Spiced Apple Pecan Bread, Aunt Sally's Coconut Pie ... Oh my goodness, that's just a partial selection of the amazing sweet treats that Link shares. Now, which books would I pair this cookbook with? Quite simply any Southern title, but having just read Sandra Hill's Snow on the Bayou that would get my vote. I'm planning on comparing recipes for the Monday Red Rice and Beans in each book and coming up with one that will be my own. 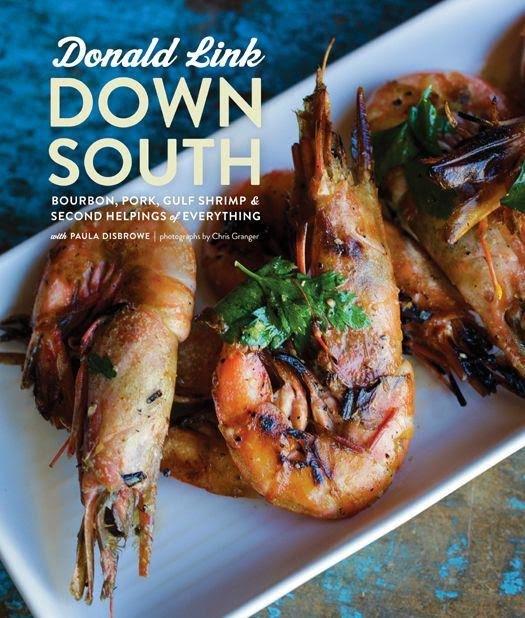 If you love good food, great conversation, and the South, Donald Link's Down South is a must-read for your cookbook shelf. Even if you don't cook, this is a book that you'll enjoy reading. Perhaps best known as the James Beard Award-winning chef behind some of New Orleans’s most beloved restaurants, including Cochon and Herbsaint, Donald Link also has a knack for sniffing out a backyard barbecue wherever he travels and scoring an invitation to sample some of the best food around. In Down South he combines his talents to unearth true down home Southern cooking so everyone can pull up a seat at the table and sample some of the region’s finest flavors. 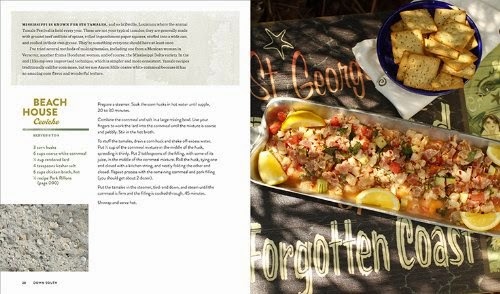 Link rejoices in the slow-cooked pork barbecue of Memphis, fresh seafood all along the Gulf coast, peas and shell beans from the farmlands in Mississippi and Alabama, Kentucky single barrel bourbon, and other regional standouts in 110 recipes and 100 color photographs. Along the way, he introduces all sorts of characters and places, including pitmaster Nick Pihakis of Jim ‘N Nick’s BBQ, Louisiana goat farmer Bill Ryal, beloved Southern writer Julia Reed, a true Tupelo honey apiary in Florida, and a Texas lamb ranch with a llama named Fritz. Join Link Down South, where tall tales are told, drinks are slung back, great food is made to be shared, and too many desserts, it turns out, is just the right amount.